We were in no rush to reach Fradley; the local coal man is delivering on Thursday, and I’m collecting a hire car for the weekend on Friday. So we decided to stay at Hopwas yesterday. The weather stayed dry and bright, but cool in the brisk wind. 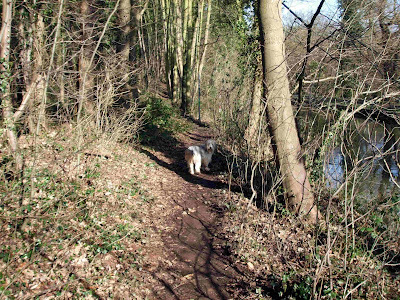 The dogs enjoyed themselves on walks around Hopwas Wood. After a chilly night we woke to blue skies again and the wind lighter, but cloud filled in a little in the afternoon. 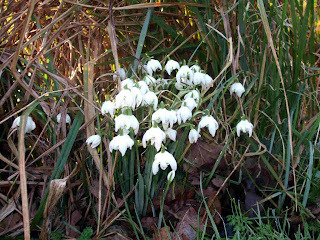 Still, it was mild in the sunny spells. We got away just after 11:00, and had a steady cruise down to Fradley with a “shop stop” for a few bits and pieces at Whittington. 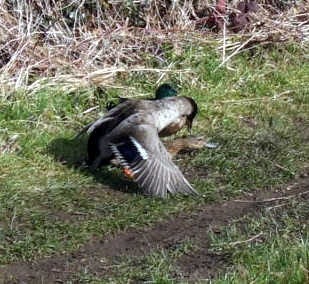 And a pair of frisky mallard drakes trying to “get it on” with a female (Hen? What do you call a female duck?). You can just see her head sticking out on the right. We arrived at the moorings just before the junction at around 16:00, and I set off to walk Meg around the Nature Reserve. Who was moored just around the corner but No Problem, with Sue and Vic aboard. We’d not seen them since last November on the Shroppie. While we caught up with the news, Meg and Meg reacquainted themselves. 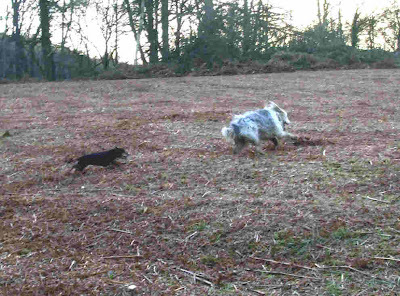 Last year Sue’s Meg was a little smaller and was bowled over by our Meg. Now the position is reversed! 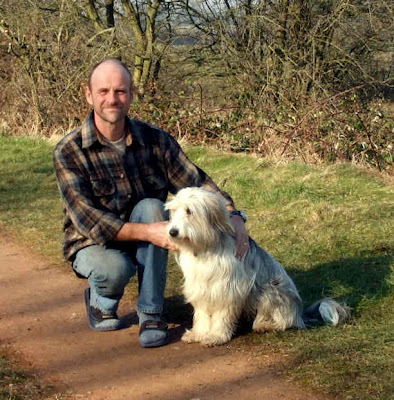 We took all 3 dogs around the Reserve before tea, and we’re going for a coffee later this evening. It’s unlikely we’ll see them again this year; they’re heading for the River Nene while we’re heading north-ish, though undecided about the route as yet. Had a quiet day yesterday. I met the lockie and had a chat. He told me to watch out for the paddles on the bottom lock as they are leaking badly. We also put the world according to BW to rights. 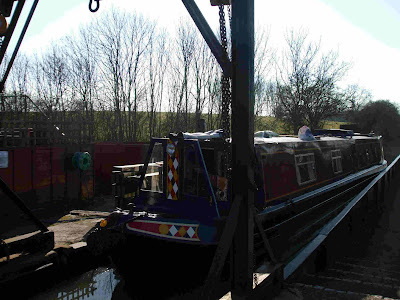 Today we were getting ready to set off for Hopwas on the Coventry, when same lockie came along and told us that the bottom lock is to be repaired today, in fact starting NOW. It shouldn’t take more than a couple of hours, though. So we hung on till 11:00, then I walked the short distance to lock 9, set it and left the gate open ready for Carol to lead the way. She’d just pulled off the mooring when a dozy women on a boat coming up opened both the lower paddles on the lock without checking. We lost about 8 inches of water out of the pound before the top gate slammed shut with a loud crash and spray of water. Luckily, there was no damage. When asked, she said she forgot to look. A good job our mate the lockie wasn’t around! Anyway, we locked them up and sent them on their way up the flight, then we had an uneventful run down through the last 3. 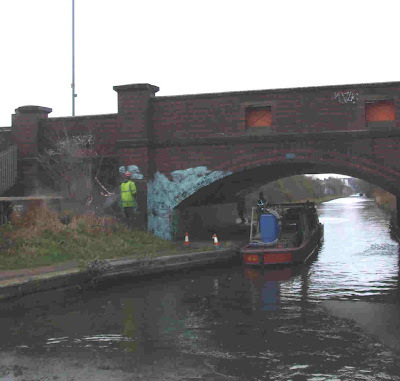 The BW repair crew had finished the job on the bottom lock by this time, so there was no hold up. 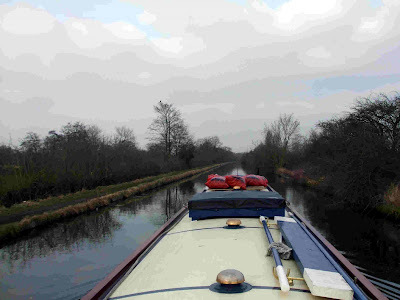 A gentle cruise of 2½ miles to Fazeley Junction, where we filled with water etc. 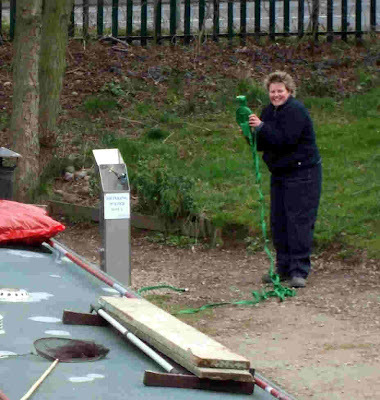 Carol pulled in to Fazeley Mill Marina for diesel, and decided to fill up with water at the same time. She’d bought one of those lay-flat hoses on a reel you wind, nice and compact but I wouldn’t have one given. The problem is you have unwind the whole damn thing, even if the tap is only 6 feet away! Here’s Carol wrestling with the hose while waiting for the fuel. 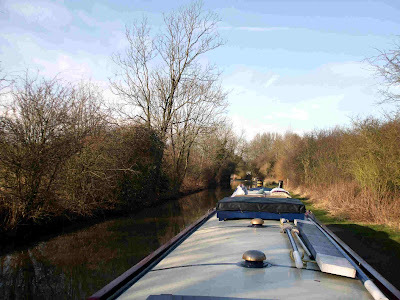 Turning left at the junction takes us onto the Coventry Canal, and we cruised for another 2½ miles before arriving at Hopwas. We moored just on the north side of the village, while Carol stayed near to the Tame Otter, to be more convenient for Sonja arriving tonight. 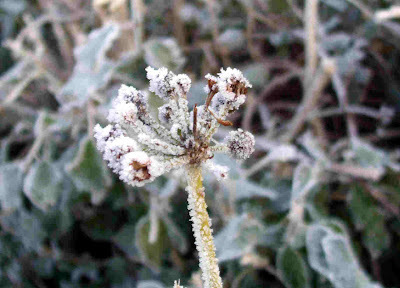 The day started fine and sunny after frost, but deteriorated later, becoming windy and cold. Just a short run today under grey cloudy skies. 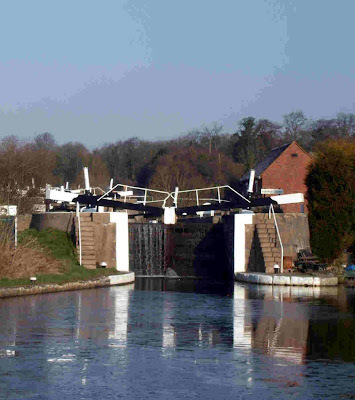 Down through the first 8 locks of the Curdworth flight, leaving just 3 for Monday. 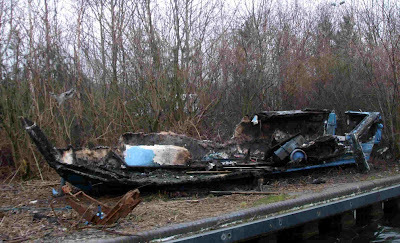 In fact these will be the last till Fradley Junction, 15 miles away. Well maintained lock gear and no need to drag loads of rubbish out before opening the gates. Moored for the night (and tomorrow) near The Dog and Doublet. Well we knew it was going to be a long day yesterday, but hadn’t anticipated it being quite so long. 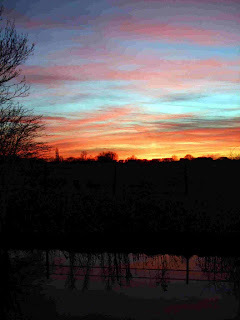 We moored up at nearly 7 o’clock, the last ¾ hour in the dark! These kind gentlemen were cleaning off old designs, ready for repainting by the local youths. 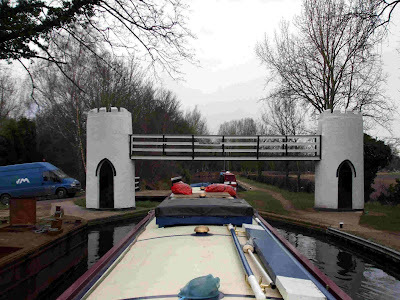 We arrived at the top of the Camp Hill flight of 6 locks at around 11:45, used the facilities and dropped down the flight, ending at the right turn at Bordesley Junction. It was the first lock of the Garrison flight that caused us to have to cruise so late. Carol locked through first and set off to the next one while I refilled the lock for us. After locking down, I couldn’t open one of the bottom gates to let the boat out. It took nearly an hour of poking around with the boat hook attached to the long pole before we managed to open the gate far enough. Without the aid of a local chap called Ben, we’d probably still have been there now! Through the remainder of the flight without incident, in an area that it is kind to describe as “run down” and on to Salford Junction, almost under Spaghetti Junction where the M5, M6 and several A roads combine to baffle the average motorist in a maze of sliproads. (I know, I’ve been a baffled motorist). Today’s (and probably this year’s) SBD Award. Salford Junction. Luckily, only 4 directions to choose from…. 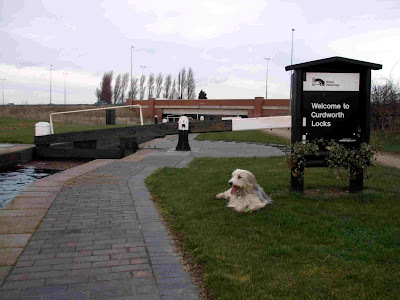 It was getting late by this time, and we still had a few miles and 3 locks to do to get past Minworth and towards Curdworth where we planned to stop. So the engines had a good workout on what is now the Birmingham and Fazeley Canal. 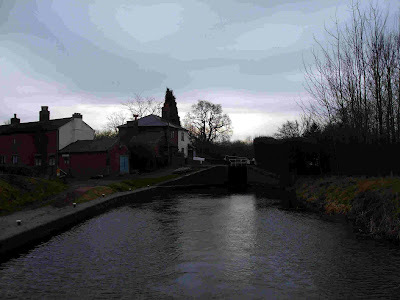 The last lock was passed in the dark, then we carried on until reaching the edge of Curdworth and stopped alongside a pub called The Kingsley. I thought Carol had stopped here too, but neither of the 2 boats moored in the gloom turned out to be Corbiere. She’d pushed on another mile and moored in the middle of the village. Anyway, we called it a day, even though it was a spot we wouldn’t normally have chosen. Today we moved down to join Carol in Curdworth, then stayed the day. 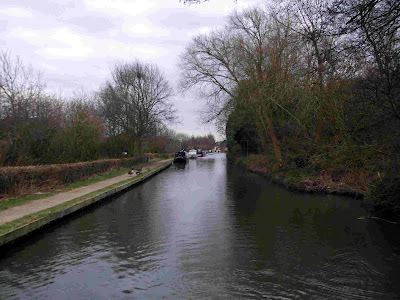 We’ll move on down through Curdworth Tunnel and the locks tomorrow. 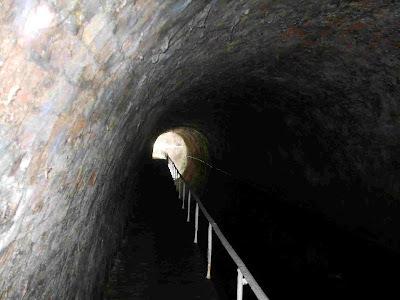 57 yard long Curdworth Tunnel. 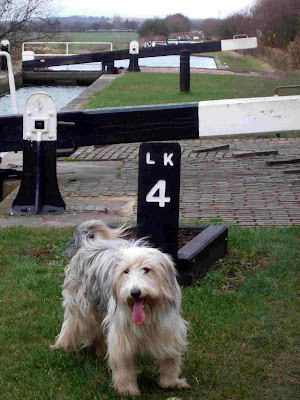 Curdworth Top Lock, the M42 and Meg posing. We’ve been stuck here since Saturday, with the ice on the canal getting thicker. It’s a pleasant spot though, and we’ve plenty of supplies, so it’s no hardship. The weather has been glorious through the day after early mist, and way below zero at night. The weather changed overnight, no frost, and, although we’ve not seen much sun today, it’s been fairly mild. So the ice is starting to thin. I spent a few minutes breaking it up alongside the boat ready for an early start tomorrow. 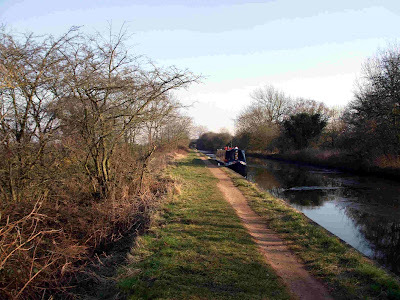 We’re going to meet Carol on NB Corbiere at Catherine de Barnes, then head into Solihull, aiming to get to the other side of Minworth before stopping. It’ll be a long day. Sorry about the gap in postings; I’ve had a problem with my anti virus and firewall software, so was reluctant to spend much time online. But, thanks to McAfee’s technical support, all is back to normal again. So, what have we been doing since last Tuesday? Well, in the words of that chap on the A Team, “I love it when a plan comes together”! 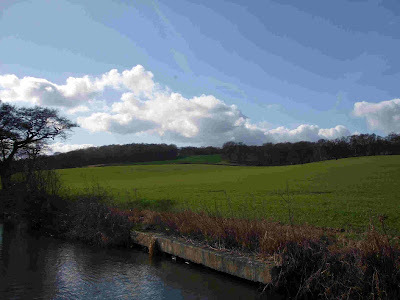 We left our mooring at 09:30 on Wednesday, and by just after 10:00 were moored at the water point in Lowsonford. This is alongside a small car park for the use of the permit holder moorers just along the canal. Got a phone call from the coal man to say the delivery would be about 12:30, so took Meg for a walk while we waited. Spot on half-past, the transit with the coal arrived. (Calcutt & Son, from Henley in Arden, 01564 792436. If you are local and need fuel, give them a call. They're very helpful.) We’d got the 15 bags on the roof and I’d just closed the gate behind them when Mr Tesco arrived. So it was open the gate again, and the side hatches, and pass in what seemed like enough supplies for a transatlantic crossing! Everything safely aboard, we moved up through the last lock and moored almost opposite The Fleur de Lys again. Carol and Sonja arrived a little later, and collected their portion of the rations and the fuel (you didn’t think all that was ours, did you….) then we relaxed for the rest of the day. Thursday heralded a short-lived change in the weather. Still dry, but it turned a lot colder with cloudy skies and a cold wind. We decided to stay put, and move on on Friday. So yesterday we were away around 11:00, up to Kingswood Junction for the services and then turned through the Link again and back onto the Grand Union. Looking back to the Lapworth Link. 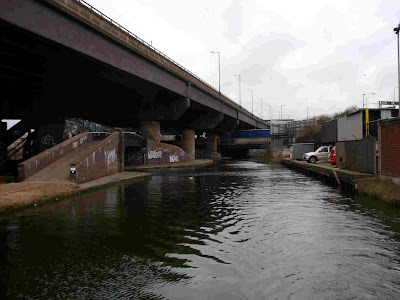 Under the bridge on the left to Stratford, though the lock on the right to Birmingham. 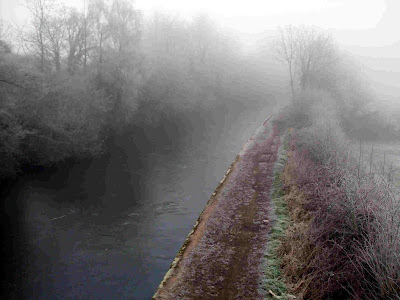 Turning left on the Grand Union, the character of the Main Line asserts itself again, straight, deep and wide. Grand Union north of Kingswood Junction. 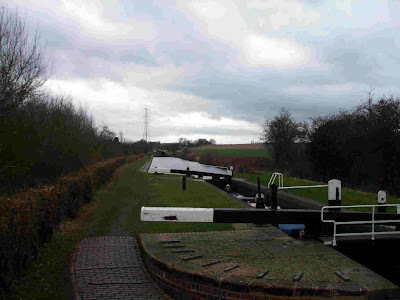 We had a steady cruise of 3¼ miles to the bottom of Knowle Locks, planning to stop here for the weekend. 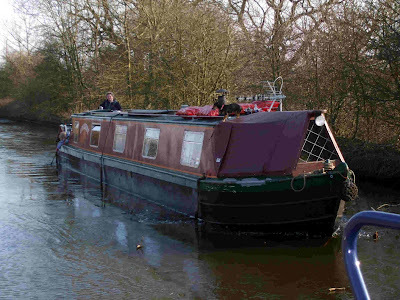 Luckily, Carol had a chat with a guy moored further along the canal who told her that the locks were closed from Monday for 10 days for maintenance. I’d missed that on the stoppages list. The plans for stopping for the weekend were scrapped, and today we moved up through the locks and carried on another couple of miles before mooring out in the wilds near bridge 74. 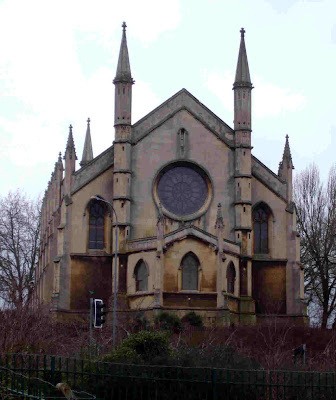 Carol passed us, to moor nearer Catherine de Barnes and civilisation. 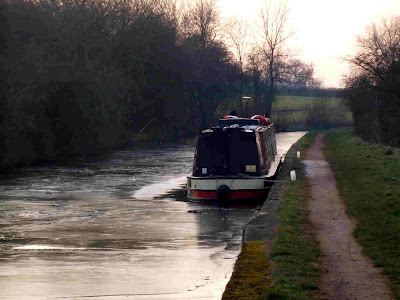 The weather is back to frosty nights and fine sunny days, but unfortunately that means a bit of ice-breaking to do. 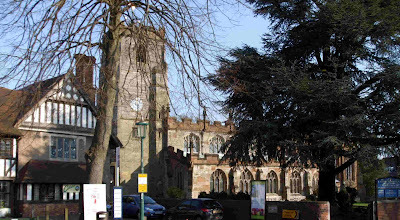 Before leaving this morning, I had a walk around Knowle. 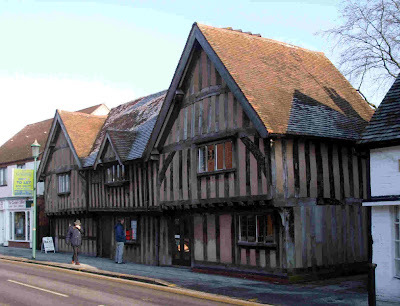 A pretty village, with some interesting old buildings. It struck me last night that we’ve not put any diesel in the tank for a while, in fact not since 4th January! We usually do about 1Lt/hr for the engine and the heating, and adding the hour meters together we should have used about 155 litres. The tank holds about 165, so it was a good job we only had to reverse 200 yards to get on the pump at Anglo-Welsh. We’ve done well though, because we filled up at 133 litres, so that’s 0.86 Lt/hr. Anyway, fully fuelled we set off towards Lowsonford. I’d spoken to a local coal merchant last week, and he rang this morning to say he could deliver tomorrow. So we arranged to meet him at the water point in the village in the morning. Knowing this was happening, I’ve also arranged a Tesco delivery to the same place. So we’ll have full tanks, full coal bunkers and full cupboards, all in 2 days! 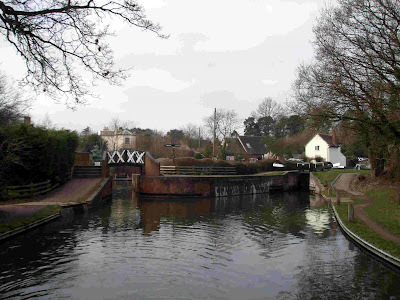 The rendezvous is on this side of the village, just before lock 31, and strictly speaking there’s no mooring there apart from for taking on water. But as the canal is so quiet, I can’t see it being a problem. So we decided to stop just after Lock 33, leaving us just ¾ mile and 1 lock to clear by 10:00 tomorrow. It’s been another grand day, warm and sunny. 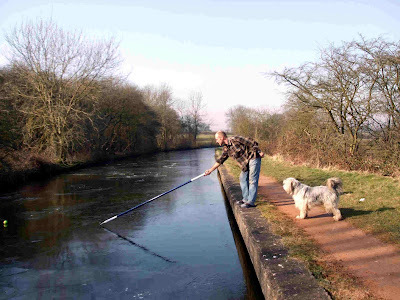 But last night was the coldest for a few days, with thin ice in places on the canal. The bridges on this canal are I think unique. 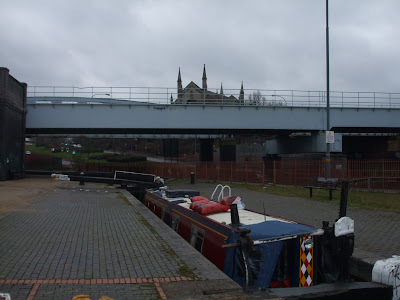 Normally, the navigation and towpath pass under the arch, but here the builders decided to send the path over the shoulder of the bridge, allowing the bridge span to be a lot narrower, in fact just wide enough for the boat. This is fine now, but in the days of horse drawn commercial boats, had an obvious flaw in that the tow rope went over the bridge while the boat went under. 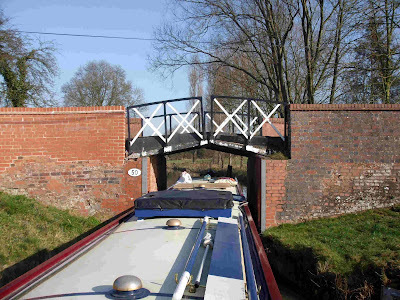 So, to save the boatmen having to unhitch the rope at every bridge, the solution was to cantilever 2 short cast iron bridge decks out from the abutments, leaving a 1” gap in between for the rope to pass through. Neat, eh? The simplest ideas are often the best. 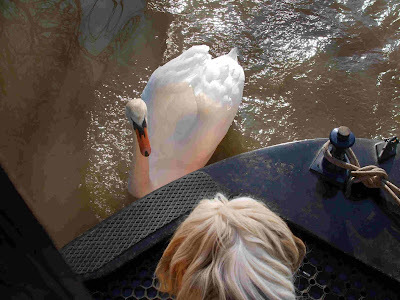 We met a swan who decided we were invading his territory and attempted to take a lump out of Megs’ nose! Here they discussing a compromise. 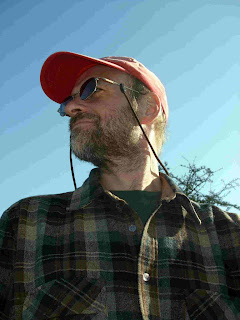 And Mags said there’s not enough photos of me on the blog, so she took this one looking up my nose…. The fine weather continues, though I hear it’s set to change mid week. Still, we’ll take advantage of it while we can. 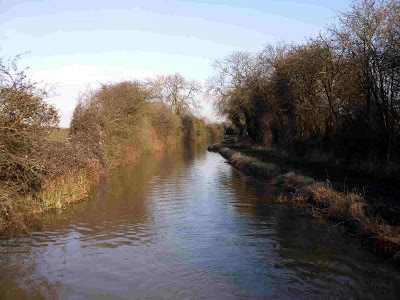 We moved away from Wilmcote soon after noon, and had a gentle cruise back to Wootton Wawen, arriving a couple of hours later. 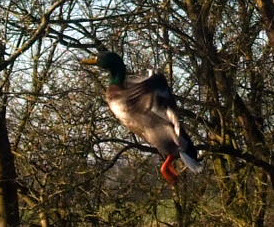 Occasionally ducks will take off as you cruise past and I’ve been trying to catch one on camera. Today I succeeded, but against a woody background, unfortunately. 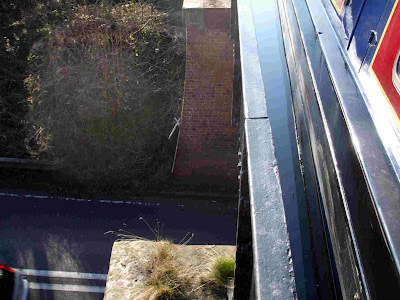 We travelled back over Edstone Aqueduct. Arriving at the Anglo-Welsh hire base at WW basin, we took on water and emptied a loo tank. It’s a bit of an exposed location, though. 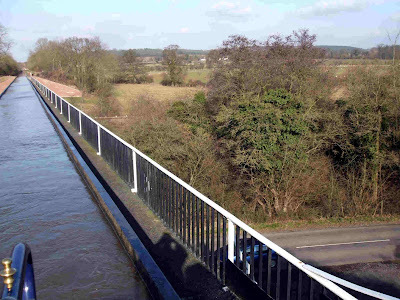 You have to moor on the aqueduct over the A34! Moored on the visitor moorings again, and I had an hour or so sitting on the back deck in the warm sun reading, before taking Meg for her afternoon constitutional. What a fine weekend it’s been. Cold, frosty nights and gorgeous sunny days. 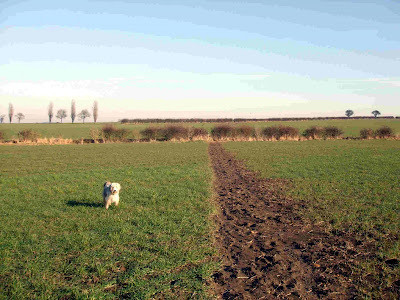 Meg and I have had some long walks over the farmland in the area. 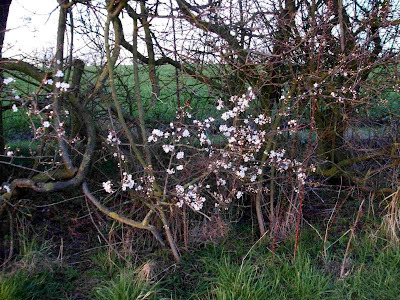 Signs of spring are appearing – hawthorn blossom already! 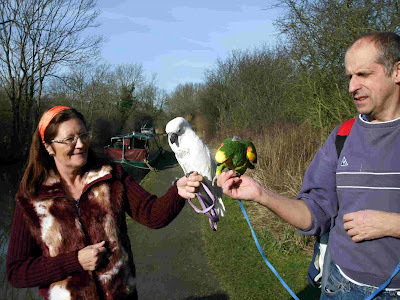 A couple were out on Saturday taking their parrots for a walk! 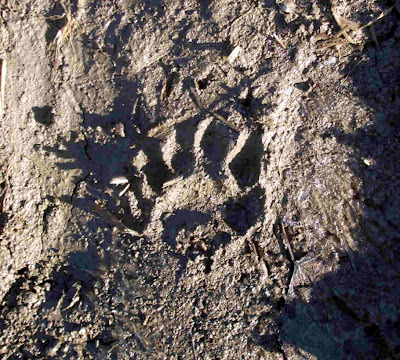 Local badgers had been using the same muddy paths as us. 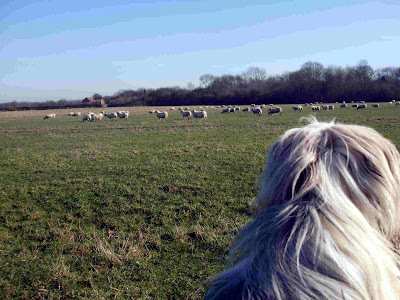 And Meg is happy to sit and watch the sheep, now. She no longer thinks of them as playmates! On the move again tomorrow, back up towards Kingswood. I’ve arranged for a local coalman to deliver to us in the week at Lowsonford, and we’ll get a Tesco delivery at the same time. Locks 0, miles 0 (by boat, but several on foot!). 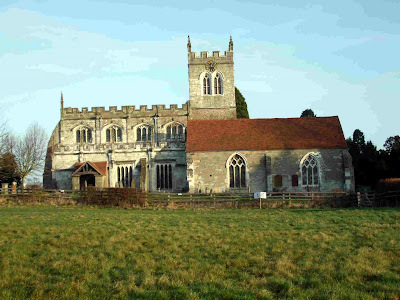 I had a walk to Wootton Wawen village this morning, just a little way along the main road from the basin. 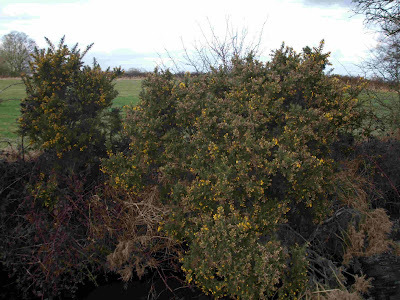 The name apparently derives from the Celtic for “Place in the Wood” and a local chieftain called Wagon. It’s pronounced “Wut’n Worn”. 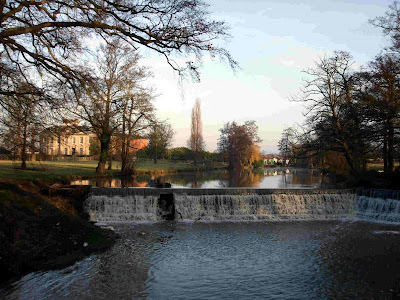 Apart from the A34 running through, it has the River Alne falling over a weir near Wootton Hall, and the 700 year old church known as The Saxon Refuge. We decided to move further on towards Stratford on Avon today, although we can’t go all the way by water due to remedial work in progress on the Wilmcott Locks. So we set off about 13:00, on our own as the girls had decided to go to Stratford for the day by bus. 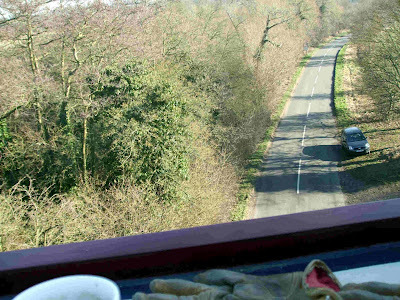 Over Wootton Wawen Aqueduct, crossing the busy A34, and back out into quiet rurality. The landmark event of today’s 2 hour cruise was crossing Edstone Aqueduct, a miniature Pontcyslte built the same way with a cast iron trough on masonry pillars. We turned at the last winding hole before the locks and reversed up to the visitor moorings near to Wilmcote. 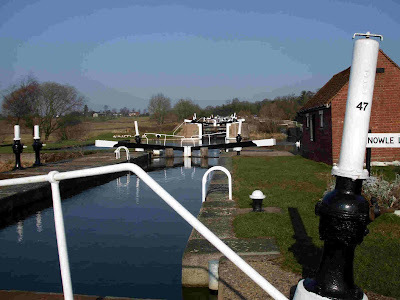 As the locks won’t be open till Easter we’ll have to retrace our steps back to Kingswood. But it’s been well worth the trip to here. The good weather we’re experiencing is due to a ridge of high pressure that looks to be hanging around for the next few days.